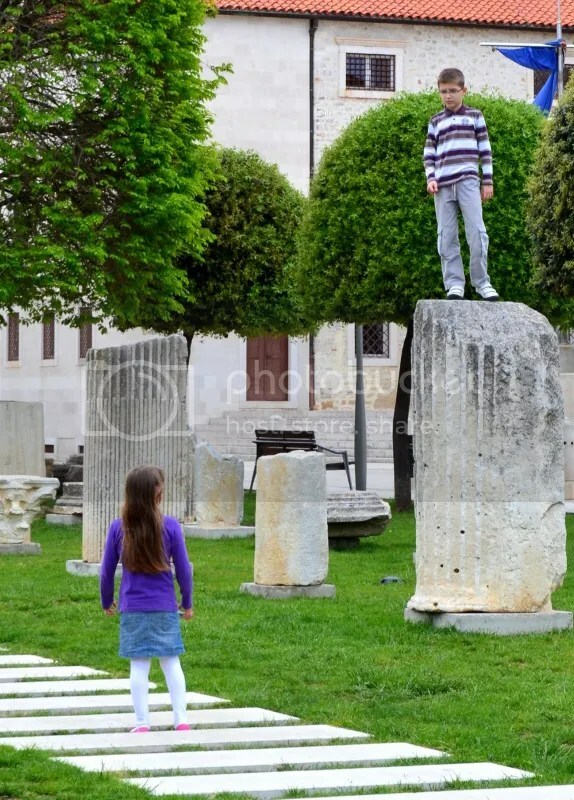 We’ve been back in the US for a few days now, but I’m certainly glad to have photographic evidence of our time abroad. Otherwise, I might be tempted to think that it was all just one beautiful dream. 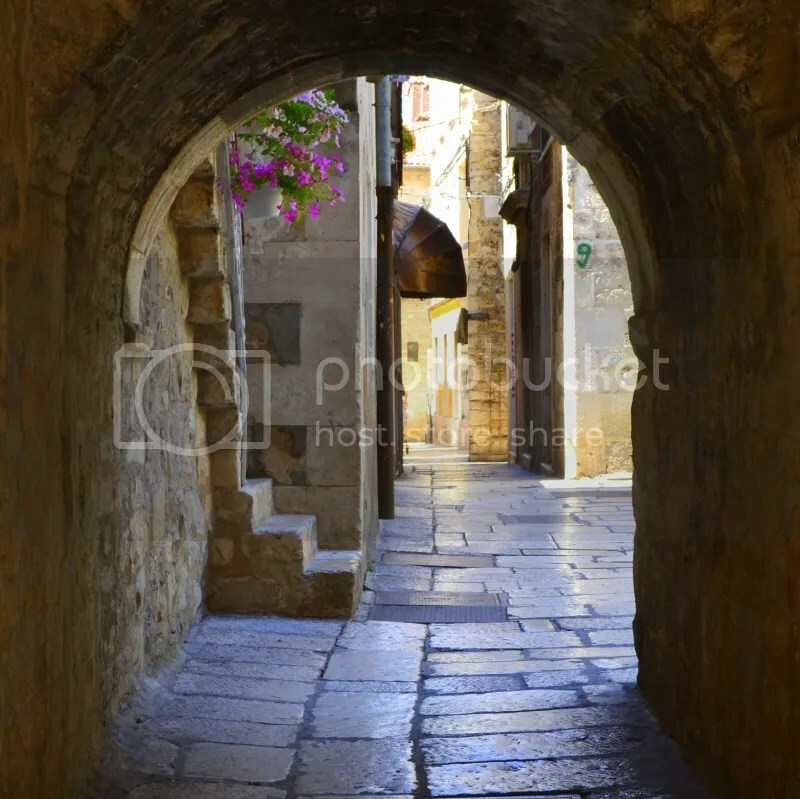 A narrow passageway in Zadar, Croatia. 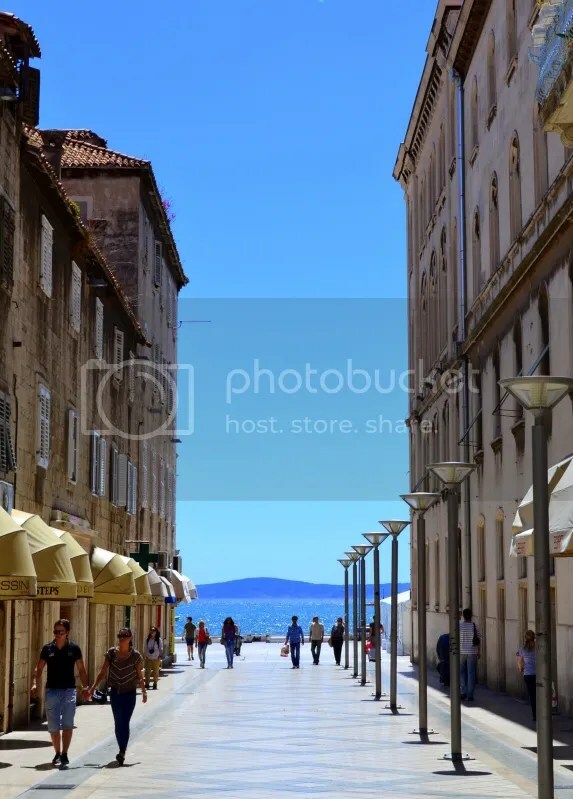 Two children playing amongst some Roman ruins in the city of (you guessed it) Zadar. 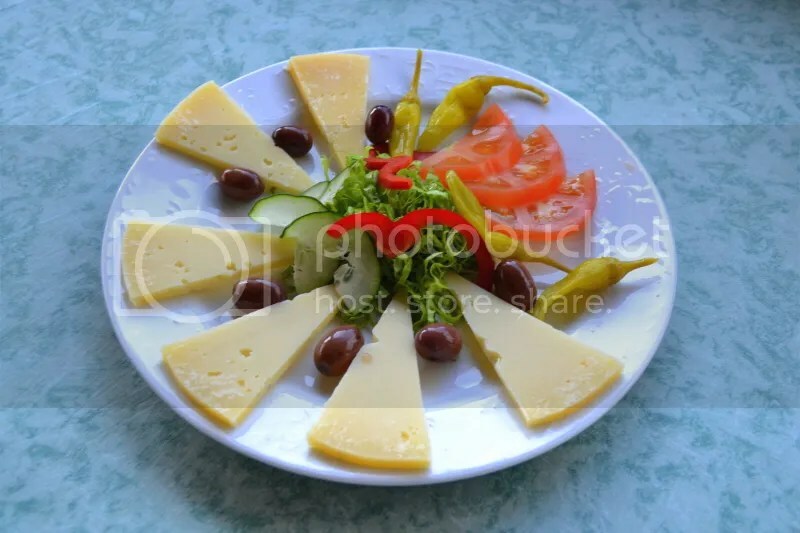 Arguably Croatia’s best cheese, Pag Cheese (known to locals as Paski Sir) is only made on the island of Pag. Derived from from lamb’s milk, Pag Cheese has a distinctively salty taste. 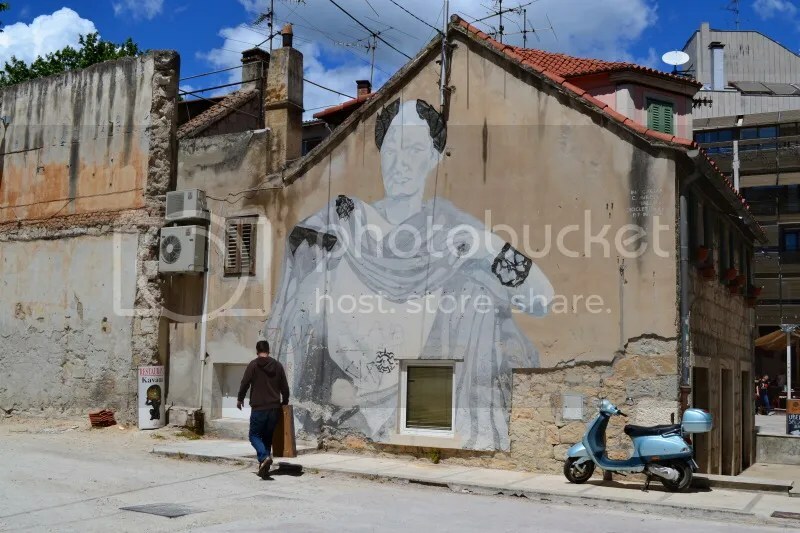 A mural depicting the Roman emperor Diocletian, who built a palace in Split following his retirement from office circa 305 A.D.
Diocletian’s Palace is now home to many tourist shops and even some residential homes. 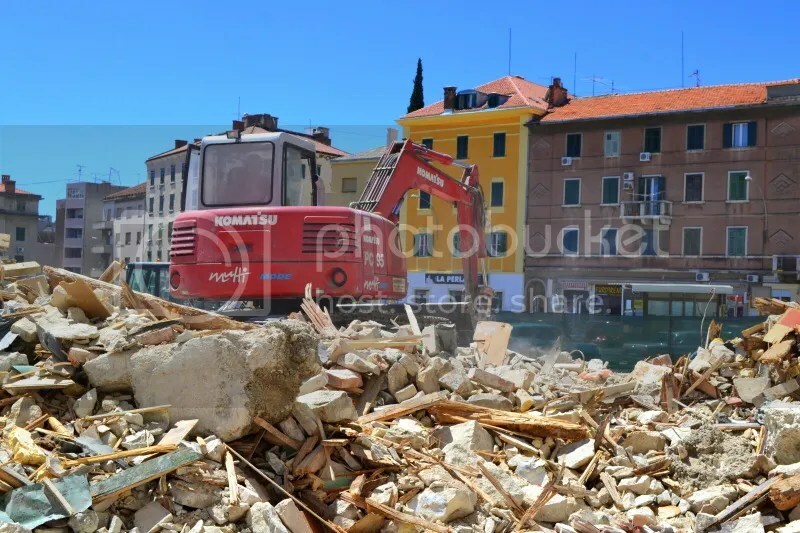 An excavator driver hard at work in Split. 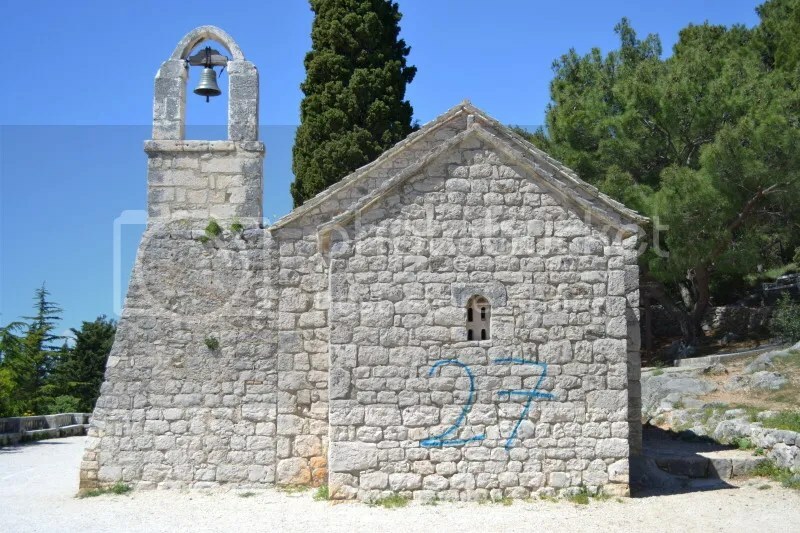 The exterior of a church in Split, defaced with graffiti. 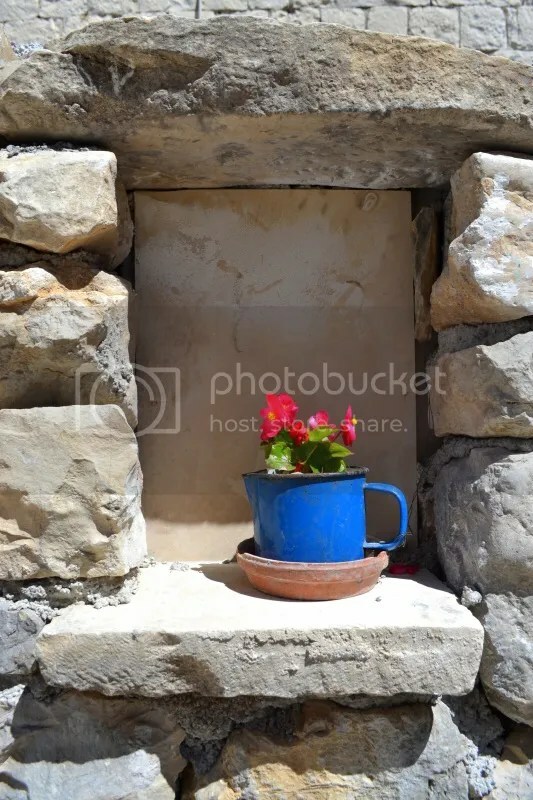 A pot of flowers sunning themselves in a residential grotto. 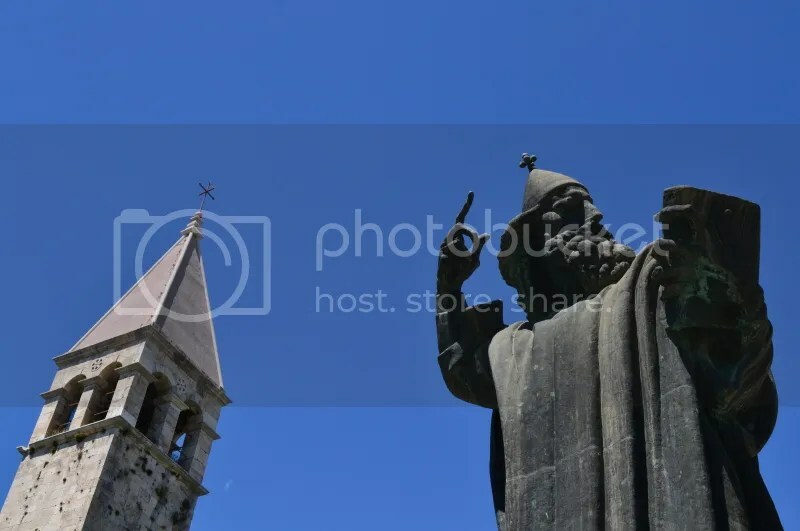 On the right-hand side of this image is a bronze statue of 10th century Bishop Grgur Ninski, silhouetted against the backdrop of a bright blue sky. 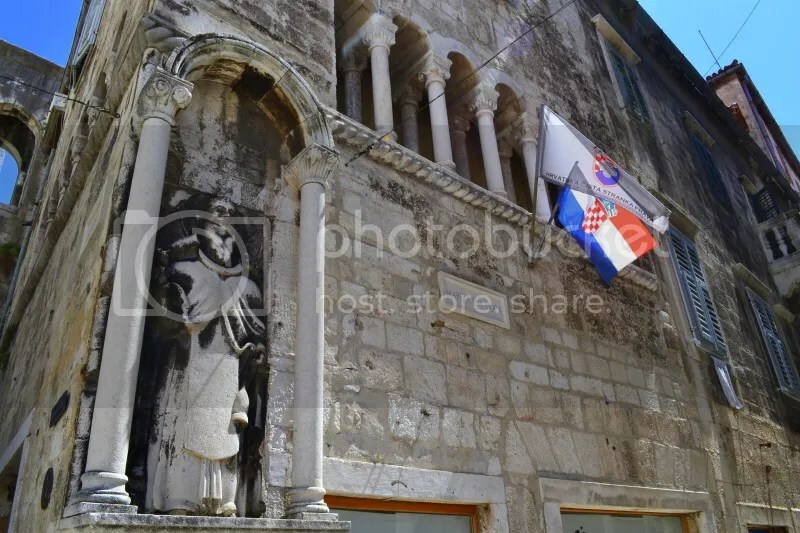 Bishop Ninski is credited with introducing the first Croatian-language masses to the locals. 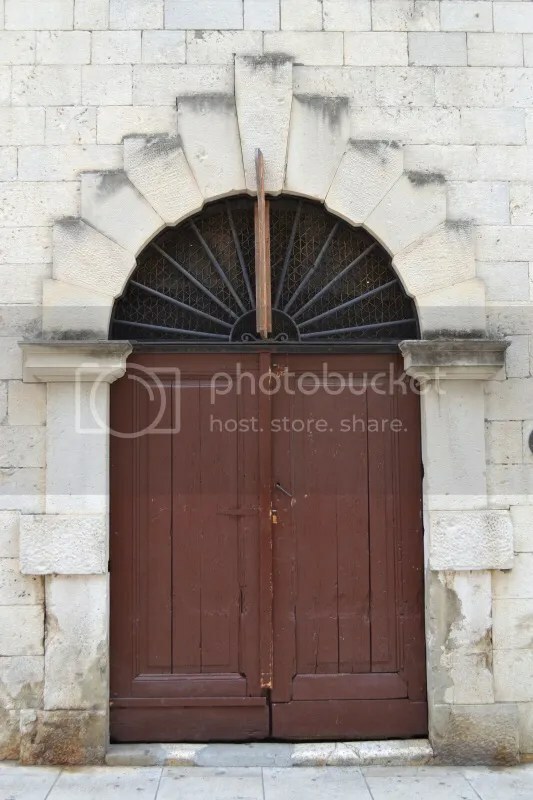 (Prior to this, all masses had been conducted strictly in Latin.) Nowadays, tourists rub the toe of the Ninski statue to receive good luck. 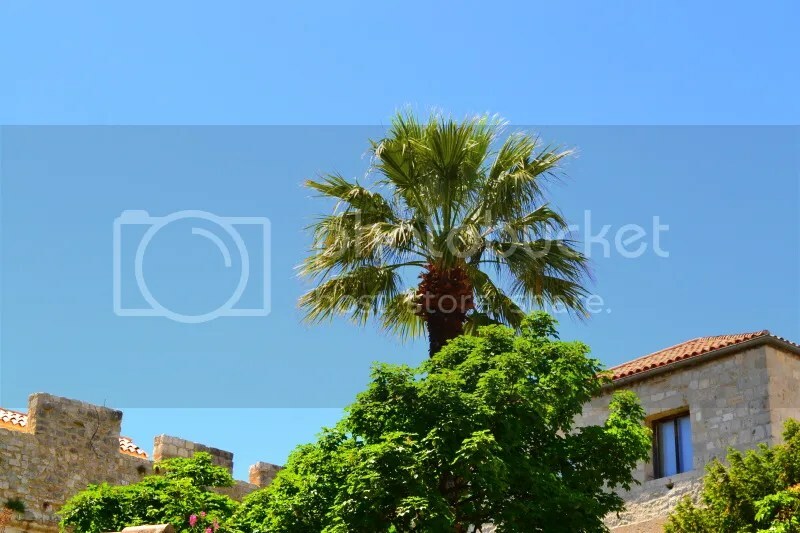 A lonely palm tree peeks its head up over the tops of some buildings near Diocletian’s Palace in Split. 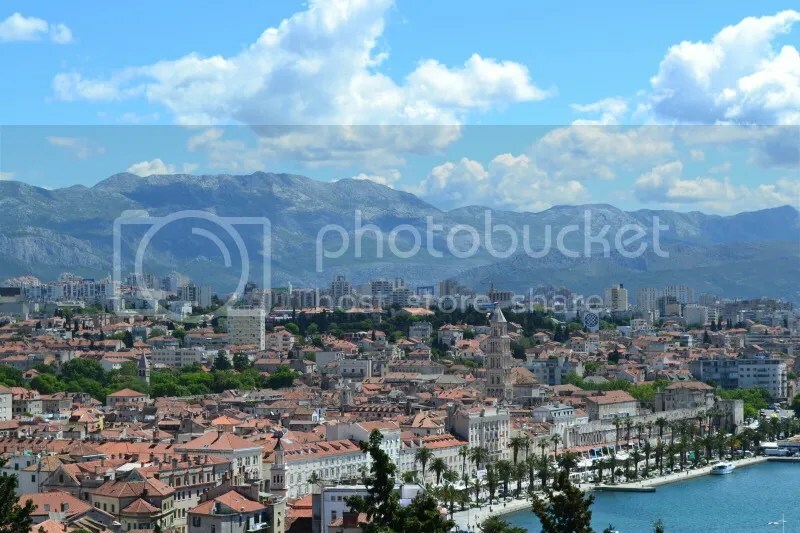 Split, as viewed from Marjan Hill. 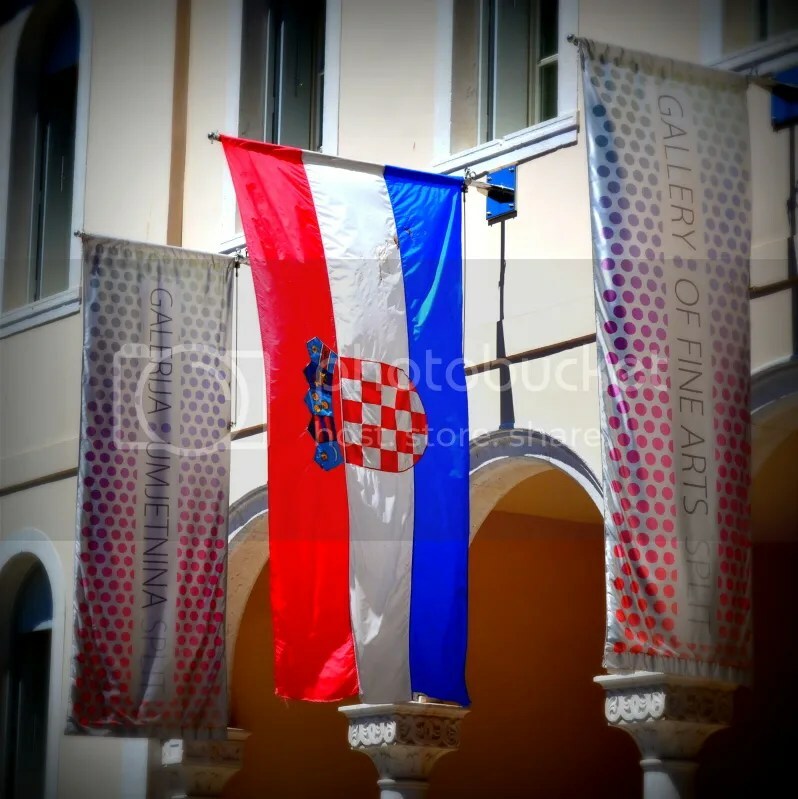 ← Croatia, Continued . 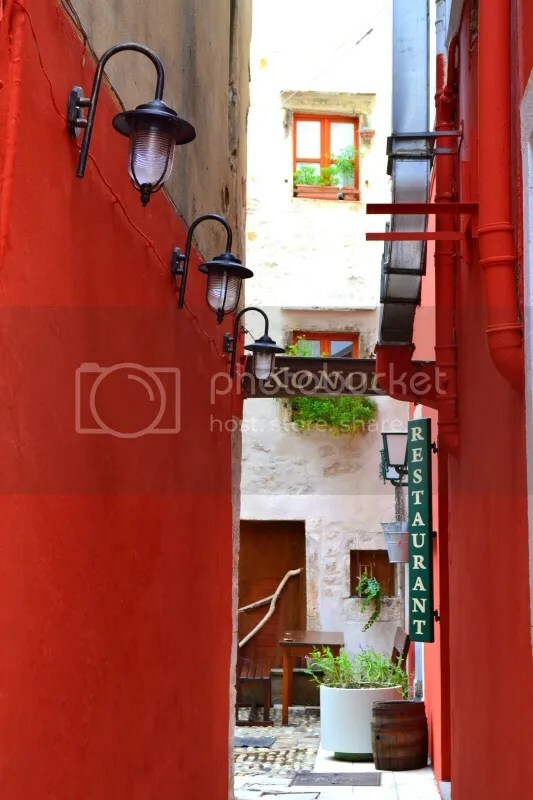 . .
Wow, amazing pictures…..very dream-like. What you said about having photographic proof otherwise you might have thought it was all a dream reminds me of a quote from Dharma Bums by Jack Kerouac, which is: “The whole trip had been as swift and enlightening as a dream, and I was back.” That’s how I always feel after vacations. I like that the building that had graffiti on it had my age (27) and the way that I write a 7 too, with a slash in the middle, haha. I really like the lambs walking down the road too and I also like how you happened to catch a couple couples hand in hand…..awwwww. Thank you. That’s a cool quote. I’d definitely like to check out that book sometime soon. It was pretty random graffiti. And catching the couples was totally by coincidence, but interesting nonetheless. The sheep were pretty funny, too. When we drove past them, they couldn’t have cared less about our presence. They were focused entirely on their snack of delicious grass at the side of the road.